A well-stocked, great-sounding modular playground that's cheap enough to warrant buying on both Mac and iPad. Excellent collection of modules. Superb sound. Surprisingly user-friendly. Desktop version is AU-compatible. Easy on the eyes and wallet. Modulars are always going to have a learning curve. Can a modular synthesiser ever really be called "minimalist"? Well, maybe if you're comparing it to deep graphical sound design behemoths like Max/MSP, Reaktor or Kyma - yet the graphically pared-down Audulus has plenty in common with those far more expensive monsters, too. For starters, it's a "node"-based environment, where low-level components (said nodes) are connected to produce custom-made instruments and effects. And like those others, it's really a programming language wrapped in user-friendly graphics, but its clean, attractive and reasonably intuitive interface makes it a lot quicker and easier to build your own devices with than most of its contemporaries. Audulus is available from both of Apple's App Stores in OS X and iPad versions, the former being a bit more expensive and offering more features, although, like it's iOS sibling, it can also be expanded via in-app purchases. The OS X version can be loaded as an Audio Units instrument or effect plugin, and it can also host other AU plugins as modules. That's an impressive capability at this price point. The desktop version also features a Sample Player node - a feature listed as "coming soon to iPad". 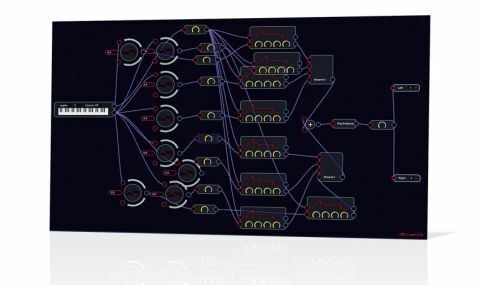 Beyond the Sample Player, Audulus boasts a wide range of nodes. All of the basics are covered and then some, familiar modules including Oscillator (four waveforms), ADSR envelope, Noise Generator, Sample and Hold, Mixer, MIDI Keyboard and Trigger; and plenty of effects including several filters (although only the low-pass is resonant). "It's the sound quality of the modules that really matters, and Audulus sounds fantastic"
At the more technical end of the scale are various mathematical function nodes that add, multiply, divide and randomise signals, among other things. A number of utilities and metering nodes are available, too, as are useful things like Sequencer, Crossfade and the aforementioned plugin host. Suffice it to say that there's more than enough here to satisfy even the most demanding modular synthesist. Of course, it's the sound quality of the modules that really matters, and Audulus sounds fantastic - although much of its potential needs to be realised by the user. This is accomplished by dragging virtual cables from one node's outputs to another's inputs, ultimately constructing a complete signal flow. Tooltips describes each input and output, as well as the controls for each node. It's all straightforward enough - assuming a basic understanding of synthesis and sound design - but advanced users won't feel like they're being underserved in terms of power and flexibility. Modular synths have never been easy, but Audulus comes as close to it as any ever has. We like that the iPad and desktop versions are edited in a very similar manner and, in fact, are compatible with one another (within the limitations of the iPad version, such as patches not being able to store presets, no Sample node and no AU support, obviously). Like any modular, Audulus can be a bit fiddly at first, but there are tutorials on the website that'll get you happily patching in no time. Ultimately, building instruments and effects with Audulus is simple and rewarding, making it ideal for newcomers to the world of modular synthesis and demanding patchcord masters alike.